In the muscle car world they don’t come much more valuable or more in demand than a genuine 1970 AAR Plymouth Barracuda. Trimming guru and Mopar fanatic Jason Turner knows all about that and has lusted about owing his own example for yours. His metallic violet example is in flawless condition to say the least. I photographed this around 5-6 years ago for him. The 1970 Plymouth AAR ’Cuda was a limited-edition machine built by Chrysler as part of its commitment to the Sports Car Club of America (SCCA) Trans Am race series where a minimum of 2,500 cars had to sold through American dealerships to the average Joe on the street. A total of 2,724 AAR ’Cudas were built in a very short and extra efficient five-week period spanning from March to April in 1970. The ‘AAR’ was a reference to the All American Racers factory Plymouth race team that was campaigning cars at the time. The car is powered by a 340 6-pack V8 officially rated at 290hp, although the rumour was that the cars were actually producing more along the lines of 325hp. Jason’s car is equipped with the TA (TransAm) variant motor with the famous 6-pack carburetors. There is one Holley 375cfm carby in the centre which is mated to twin 500cfm outboards either side of I which kick in via a vacuum actuated linkage. Painted in a bright red hue and with an air cleaner assembly bathed in bright orange the engine goes as well as it looks. The TA 340 block came with wider journals ready for four-bolt mains and the cast-iron heads contained special offset rocker arms from the factory which allowed for extra port work if the owner desired to find even more horsepower in the small block mill. Painted in a bright red hue and with an air cleaner assembly bathed in bright orange the engine goes as well as it looks. The factory 1¾-inch headers are mated with twin pipes and those awesome looking and very genuine side pipes that exit just in front of the rear 15-inch Rallye steel rims. Performance wise, the car could hit 0-60mph in 5.8 seconds and do the standing quarter in 14.4 seconds at 100mph. The 727 auto is mated with a factory fitted Hurst ratchet shifter and a mild stall converter. The 8¾inch LSD rear end comes with 11-inch drum brakes whilst the nose features disc brakes instead. Special shocks and re-cambered rear springs raised the tail 1 3/4 inches over the regular ‘Cuda specs to help allowing for clearance of the exhaust pipes. Probably the first time in history a race inspired car has actually been raised rather than lowered. Externally, the ‘Cuda shouts “look at me!” through a megaphone. The side of the car is emblazoned with the great looking ‘strobe’ stripes which progressively reduce down in width as they reach the AAR graphic at the rear. 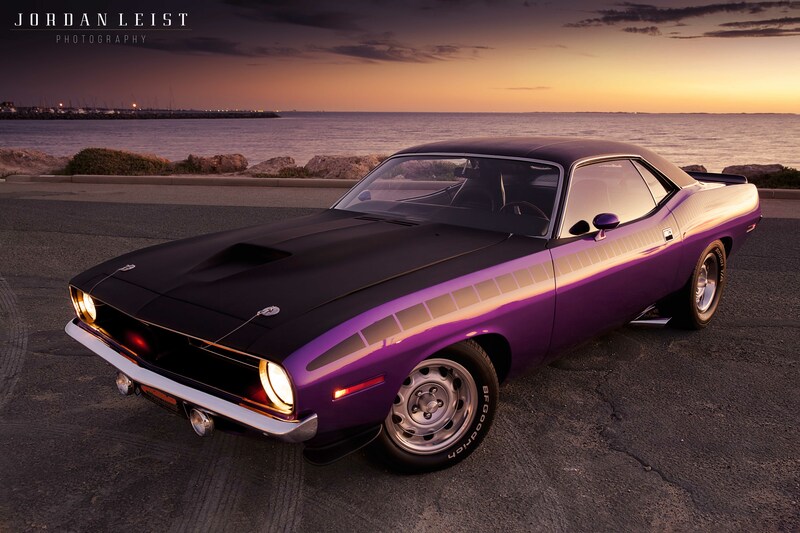 Without a doubt, the ‘strobe’ stripes are the coolest stripes that have ever been used on a muscle car, period. A matte black fiberglass bonnet is fitted with that massive scoop which is fully functional and draws in fresh air for the carbies. The bonnet pins at the front are to give that race car appearance straight off the bat. The spoilers on the AAR version ‘Cuda also set it apart from the other models. The front ‘eyebrow’ spoilers are located down low on the front guards and the rear ‘duck tail’ spoiler is a subtle addition to the boot lid. The colour coded mirrors, front spot lights, recessed park lights and of course the ultra-70s vinyl roof all do their bit to make the AAR ‘Cuda stand out amongst its rivals of the same era. Inside the car, Jason has put his skill set to work by doing a complete, factory spec re-trim – the results a period correct and perfect. Car like this; in original condition with matching numbers as well are getting harder and harder to find and the dollars to pry one from an owners hands are getting steeper and steeper. As you can imagine, Jason is in no hurry to sell this prime piece of American muscle but he does have a heavily modified version in the making. That should be something to see all over again!